Several of you have asked how Miss A’s balsamic obsession began. Well, it started when I found a recipe for Strawberry Bruschetta on Annie’s Eats. I’m always on the lookout for quick, easy and healthy recipes to make for myself for lunch. I have a terrible time with this meal. I’m usually just cooking for myself, I don’t have a lot of time and I don’t want to over eat. I figured I could easily adapt Annie’s recipe to go on my little pita crackers (my current lunch obsession) for a quick lunch. What I didn’t count on was how much Miss A would enjoy this dish as well. I mean it has goat cheese, basil and balsamic – not the type of ingredients that most little ones find palatable. Oh was I wrong on that one! She devoured her first one and kept right on going. 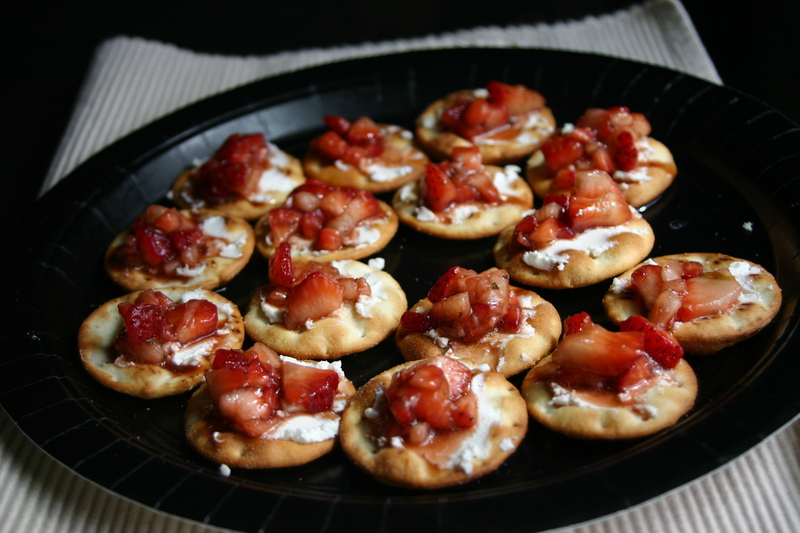 So here’s the easy to make Strawberry Bruschetta Appetizer I adapted from Annie’s recipe, and Miss A’s favorite lunch. 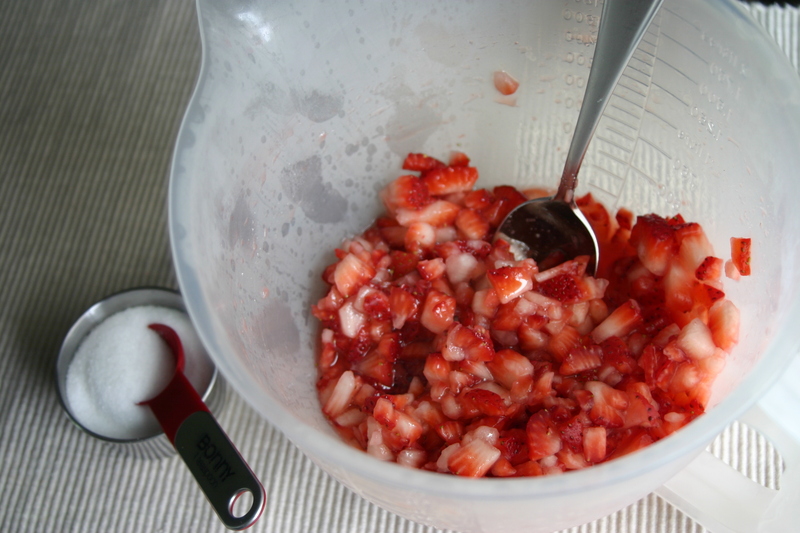 Start by mixing together the diced strawberries and sugar to bring out the juices. Next add the olive oil, balsamic vinegar and basil. Fresh basil would be best, but we didn’t have it and the dried worked just fine. Next add a bit of goat cheese to the pita crackers. And finally top with the strawberries. 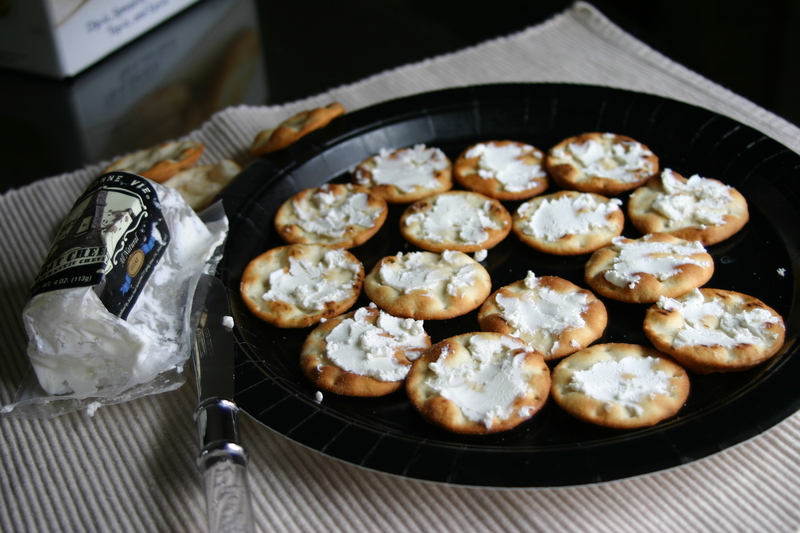 If you’re serving this as an appetizer you’ll want to do so immediately, or hold off on adding the topping until you’re ready to do so to keep the crackers from getting soggy. In our experience though – these don’t last long. We recently took a few plates to a bbq and not a single cracker was left. (And unlike the lemon bars, I didn’t fill up – well not entirely – on my own dish.) And as if there was any doubt, Miss A devoured her share before we got to the bbq that night. 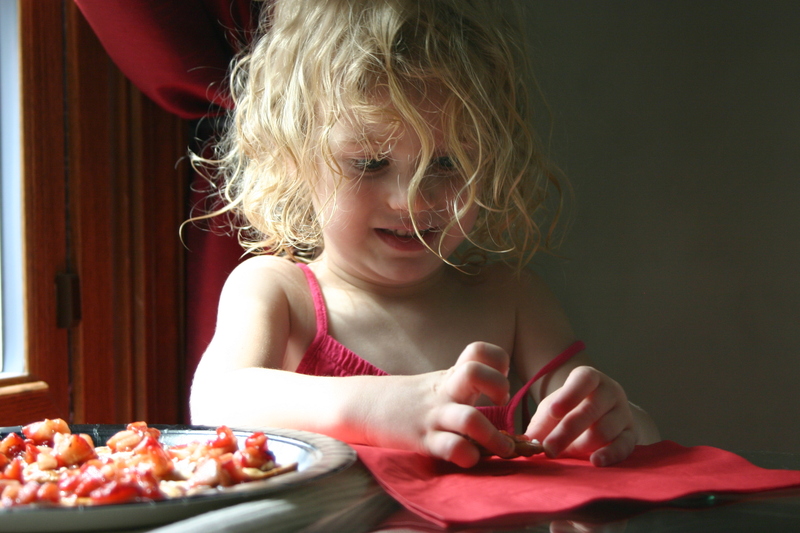 I’ve even seen her lick the balsamic from the plate when she finishes her crackers. It’s hilarious. At least her obsession is a healthy one (unlike my own). Now if I could just get her to eat a little protein we’d be in business. Have a great weekend everyone! 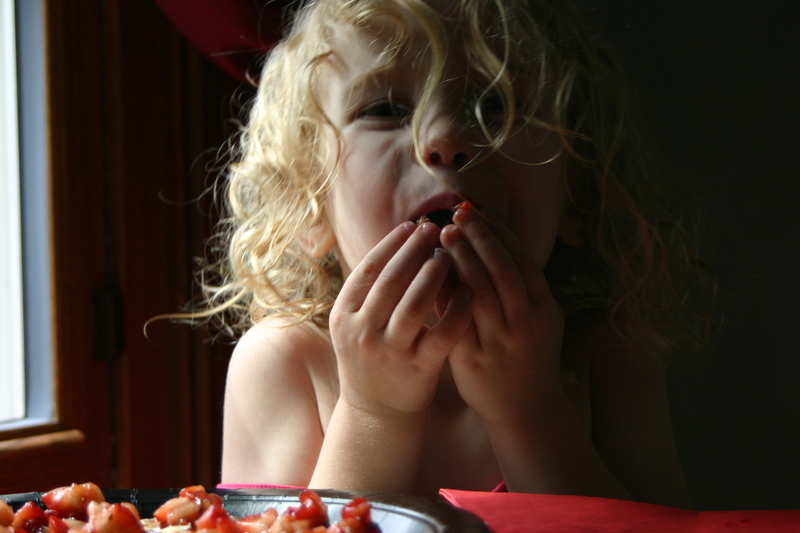 And if you’re in need of an easy appetizer or lunch, this one comes highly recommended from a budding little foodie. This sounds totally amazing. Miss A is a budding gourmet! 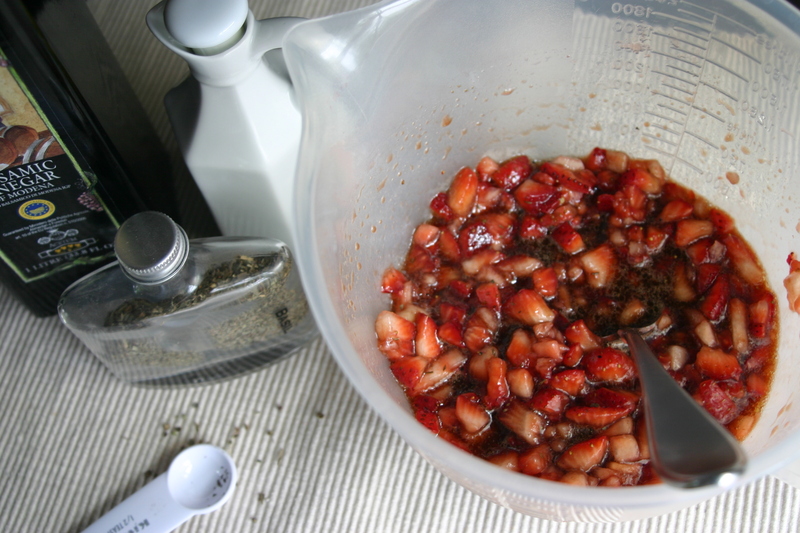 The idea of sweet strawberries, balsamic, basil and goat cheese totally makes my mouth water! Her eating habits just amaze me. She’s such a little sweetie. And she knows what she likes! It is very tasty and so easy to make! What a lovely snack…quick and delicious!! And she is just sooooo cute! What a coincidence! Today I posted a strawberry creation too! These snacks look delicious! I love strawberries!!!! I’ll have to check out your latest…I’m sure it’s amazing! Great idea to add it to crackers! I love strawberry and balsmic mix, I add it to my mixed greens with some feta cheese and chopped up pecans in the summer, soooo delicious! I will definitely try this recipe, it looks perfect for a quick and healhty appetizer! Have a great weekend! We do the same thing – walnuts though. 🙂 Yummmmy! What a great idea. I love strawberries as a savory dish. I agree that the pepper would be a great addition! Your kids are SO gorgeous!! Love this idea with the strawberries – going to give this a go! Miss A is such a cutie pie. And can I tell you the strawberries on the bruschetta actually looks interesting to me and you know I don’t like anything bread. I can’t believe I’m saying this but I might try this lol. Ok, first off: Miss A, exceeding all cuteness thresholds. 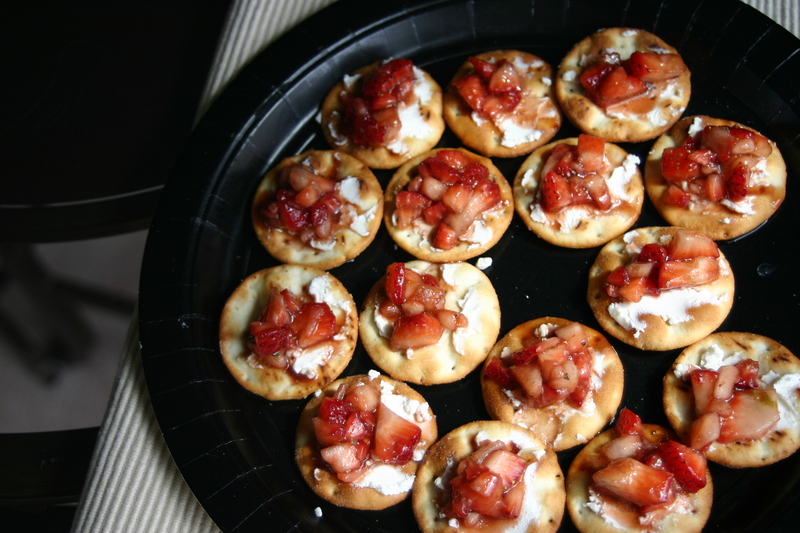 Second: must try strawberry bruschetta appetizers. Brilliant. Brillant & oh-so-Beautiful 🙂 And Sooooooooo good. I like Ms. A’s style! I’d lick the plate too as I love strawberries with balsamic! I’ve not tried it with goat cheese, so this is definitely on my plans for the weekend!! Have you tried serving Miss A hummus on home-made pita crackers? It’s the tahini (sesame paste) in hummus that makes it a complete protein especially when served with pita bread. It’s easy to make ahead, freeze and just thaw small portions to serve to her and yourself and it tastes good too. 🙂 You can also serve a plate of veggies (carrot, sliced peppers, carrots, mushroom slices) and fruit with the hummus. You can sprinkle more sesame seeds or pine nuts over the hummus to give it even more taste and texture. Check out the nutritional info in the article as well as more serving ideas. That reminds me, I have 2 cups of cooked chickpeas in the fridge to be turned into these snacks. What a great idea! I’ve never had this before but I know I’d love it so much I could eat an entire plate! It sure does make for a wonderful lunch, and your little one sure does look like she’s enjoying them. 🙂 You mentioned being concerned that she’s not getting enough protein. The goat cheese.is a source of protein. Wow, I always see that and never make it. I need to next year. Or break down and buy some California strawberries. Am I remembering right are you in Minnesota? Katherine was telling me about the bar and liquor store situation there yesterday, crazy. Hope you stocked up. If I got the state wrong, my apologies. Break down! Break down! LOL. We’re not in Minnesota – but we used to be, so good memory! We moved from there about a year ago. We’re in Chicago again now (our hometown). We loved MN though and there’s a part of us that will always think of it as home. Isn’t that govt. shut down crazy – we were just talking about that yesterday. All of the bars and liquor stores. We were in a college town and I can’t even begin to imagine what that situation will look like once school starts back up. Crazy!!! Sure thing Charles! We aim to please. LOL. 😉 Cracked pepper would go well on this for sure. Miss A isn’t a big fan, so I leave it off. Have a great weekend!